A couple of weeks back, I got some samples that made me very, very happy. They were of the alcoholic variety, and opening that box was like Christmas. 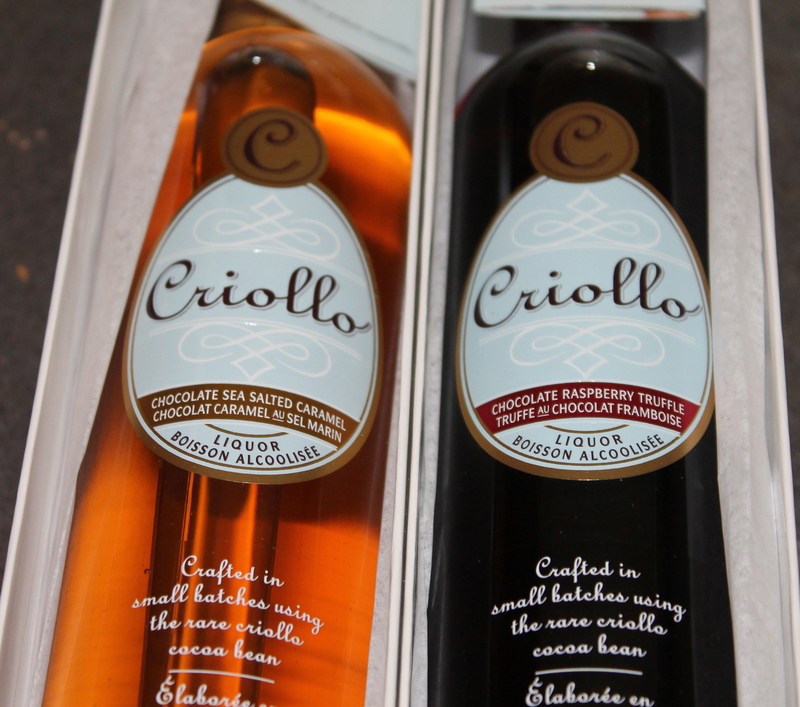 These treats came from Criollo, a chocolate liqueur manufacturer out of Ontario. The box contained two incredibly elegant bottles: one Chocolate Raspberry Truffle Liqueur, and one Chocolate Sea Salted Caramel. Alone, sipped over a bit of ice, they are delicious, and incredibly indulgent. The amber Sea Salted Caramel is syrupy, bursting with rich caramel. The Chocolate Raspberry Truffle reminded me of the raspberry-jam filled mallow cookies I used to eat as a kid, but grown-up. That weekend, I ended up in Victoria, and while there, I visited my friend Liz. She gave me some quince she had picked, and seeing as I’ve been on a bit of a tarte tatin obsession lately, I thought I’d use both in a recipe. Inspired by one made by Chef David Hawksworth, this Tarte Tatin is much simpler and more “lazy” than the Julia Child one I posted a couple weeks back. It makes individual portions, rather than an entire pie, and you can easily make it gluten-free by swapping out the puff pastry for an oatmeal crumble topping. Now, I’ve never cooked with quince before. If you haven’t either, it’s a kind of cross between an apple and a pear, but it’s more fibrous. The core is very tough, I could barely get a knife through it, and the seeds are supposedly poisonous if you eat too many of them. But they added a nice layer of flavour to the tarte tatin. In a large sauté pan, melt the 2 tbsp of the butter and add the fruit, cinnamon, vanilla, and cloves. Sauté 8 minutes. In a separate medium-sized, heavy bottomed pot, melt the 1/3 cup butter over medium heat. When it begins to bubble, add sugar and liqueur and turn heat to low. Stir over low heat until sugar is dissolved. Increase heat to medium and cook until sugar begins to darken, but not boil (about 10 to 12 minutes). Keep an eye on the caramel! Do not check your email! You can add a tablespoon or so of water if you feel like the consistency is getting too thick. Pour caramel into bottom of 6 ramekins, pack the fruit on top, and cover each with a circle of puff pastry that you’ve cut to size. Bake 10 to 15 minutes in a 400 degree oven, until the puff pastry is golden. Remove from the oven and allow to cool a little. 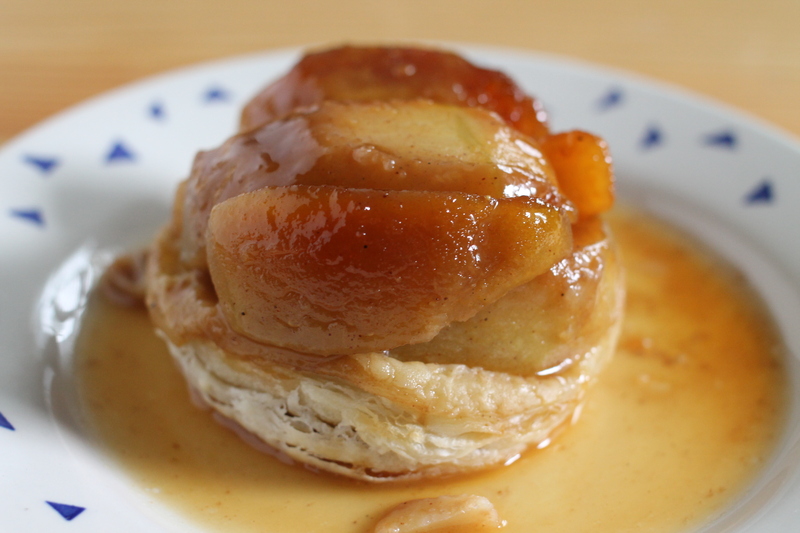 When manageable, put a plate over top of the ramekin, and then invert so that the puff pastry forms a crust on the bottom, and the caramel drips down over the apples. You can serve with ice cream or whipped cream if you like.